Our Free-Standing Thistle Sock Store Displays offer a great “impulse buy” opportunity for your customers. Convenient and easy-to-use, these free-standing displays are a great way for your customers to find exactly what they want. 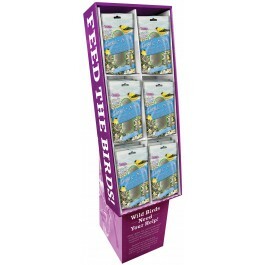 Garden Chic!® Thistle Sock Instant Feeders comes pre-filled with Nyjer Thistle Seed. Thistle Seed is the most desired seed of Finches as well as other small birds. Simply unwrap and hang to create a Goldfinch feeding frenzy! Once depleted, simply loosen the Garden Chic!® Thistle Sock Instant Feeder, and refill with more Brown’s® Song Blend® Nyjer (Thistle Seed).